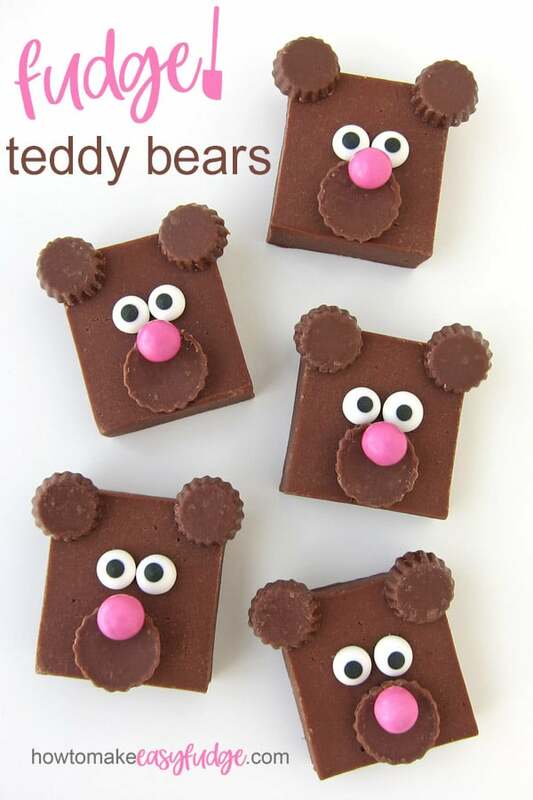 Turn squares of fudge into the cutest fudge bears in minutes. 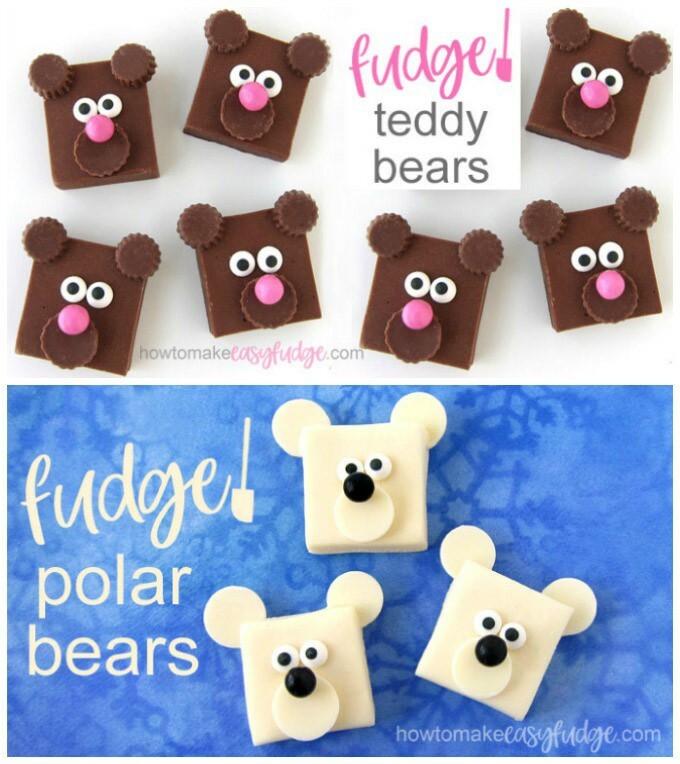 Milk chocolate fudge teddy bears or white chocolate fudge polar bears are easy to make for Valentine’s Day, Christmas, a birthday party, baby shower, or any day! 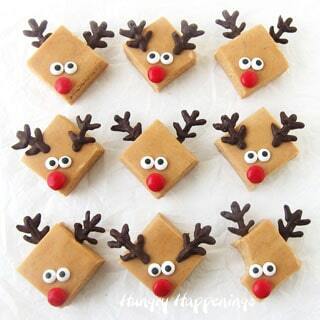 It is so fun and easy to turn squares of fudge into cute treats to serve at a party or to give as gifts. Over the holidays we created Snowman Fudge, Grinch Fudge, Reindeer Fudge and even A Christmas Story Fudge and I was excited to get back into the kitchen to create some cute fudge that would be great to share for Valentine’s Day or a cold winter’s day. 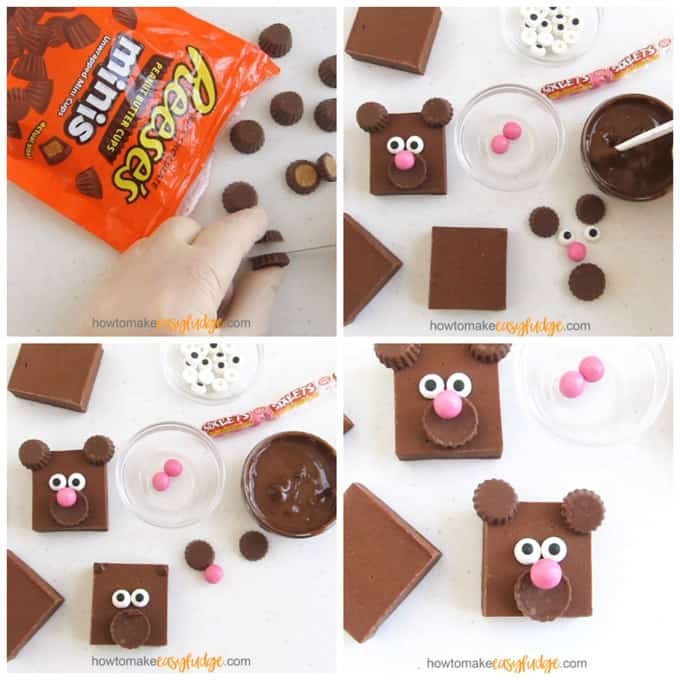 I started by making milk chocolate fudge teddy bears decorated with mini Reese’s Cups, pink candy coated chocolates (Sixlets or M&M’s will work) and candy eyes. They turned out so cute and I was having so much fun that I decided to make some more. 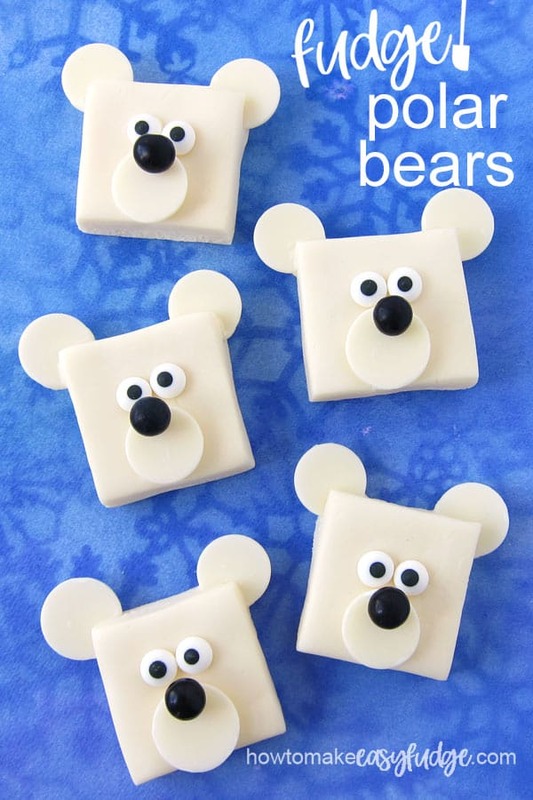 We had six inches of snow on the ground that day so I couldn’t resist making some polar bear fudge too using white chocolate, white candy melts, black candy coated chocolates, and candy eyes. Decorating fudge is really simple and making the fudge can be even easier. The fudge recipes used to create these fudge bears requires just a few ingredients and about 10 minutes of prep time. 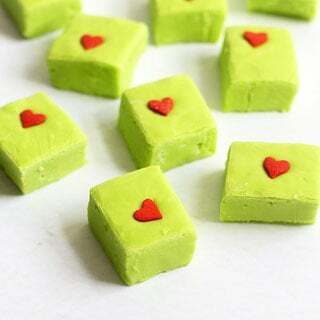 Each fudge is super creamy and delicious and perfect for decorating. 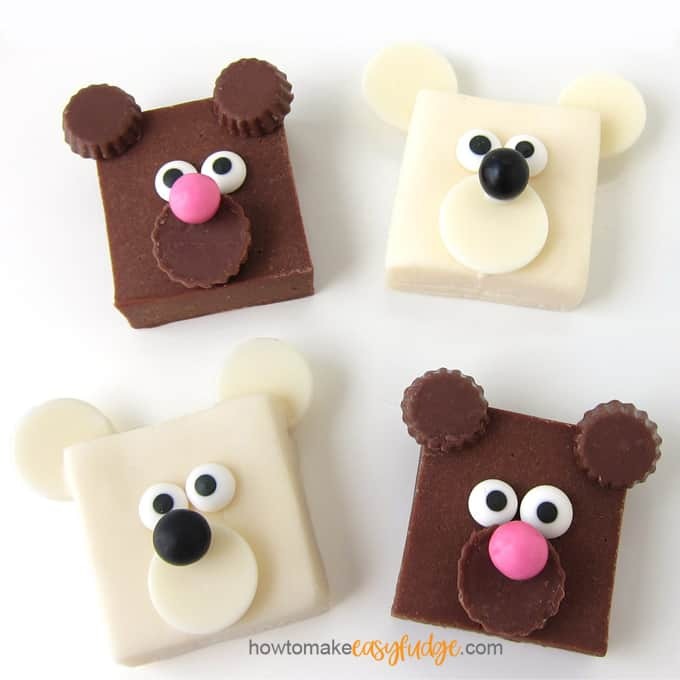 Watch this video to see how easy these fudge bears are to make and decorate. RELATED: You can see the complete tutorial for making Milk Chocolate Fudge if you’d like more detailed instructions. 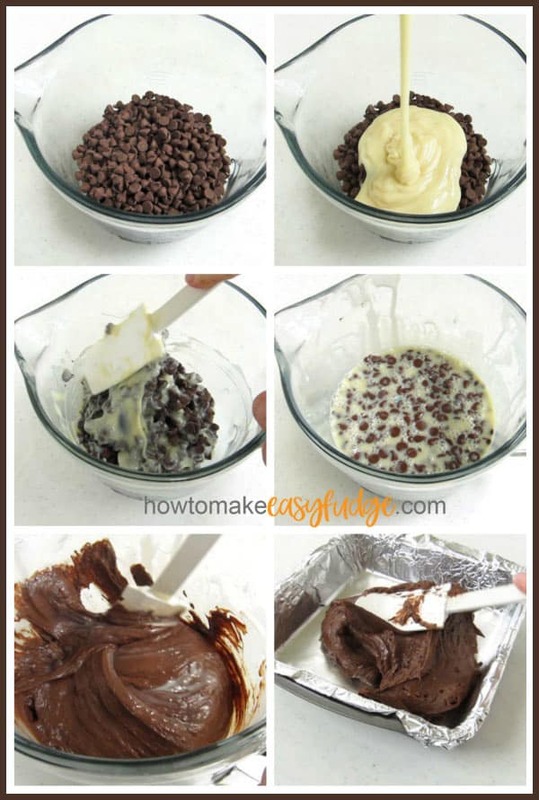 Stir together the milk chocolate and sweetened condensed milk then melt in the microwave at 70% power for 90 seconds then let rest for 3 minutes. Stir until melted and pour into a non-stick tin foil or parchment paper lined 8-inch square pan. Cover and set aside for about 4 hours or refrigerate for 2-3 hours until firm. Cut off the curved edges of the fudge, if needed, then cut into 16 squares. Be sure to choose a milk chocolate that tastes great right out of the package. When making this batch of fudge I used Ghirardelli Milk Chocolate Chips but I also love using Peter’s Ultra Milk Chocolate. It has a lovely delicate chocolate flavor with slight caramel notes. This is the milk chocolate I use for all of my candy making. It is available in 10 pound bars or 50 pound cases. If you love milk chocolate and plan to make a lot of fudge, then purchasing one of these bars will be totally worth it. Callebaut makes wonderful milk chocolate too which is available in callets (large chips) and smaller quantities. They also sell large bars, as well. Of the grocery store brands, I also enjoy the flavor of Kroger Private Selection Milk Chocolate Chips but have also enjoyed making fudge using Hershey’s Milk Chocolate Chips. You can find these milk chocolate bars, callets, and chips from amazon (commission earned for sales at no additional cost to you). Sweetened Condensed milk is milk that has been pasteurized and condensed (heated and cooked to remove most of the water) and sweetened with sugar. Using sweetened condensed milk to make fudge allows you to eliminate boiling sugar and milk yourself and you won’t need to use a candy thermometer. Fudge made using sweetened condensed milk always comes out smooth and creamy too! NOTE: Do not mistakenly pick up a can of Evaporated Milk. They are usually right next to cans of sweetened condensed milk on the shelf at the grocery store. Evaporated Milk is not thickened or sweetened and will not work in this fudge recipe. Cut two Reese’s Peanut Butter Cup minis in half so you have two round pieces of candy. One of the larger circles will become the bear’s snout and the two smaller circles will be the bear’s ears. You can snack on the other larger circle! Use the melted chocolate or candy melts to attach the snout along one edge of the fudge. Then attach a pink candy nose along the top edge of the snout and two candy eyes just above the snout on the fudge square. Attach the two Reese’s ears on the opposite corners of the fudge. That’s it! Making fudge teddy bears is seriously that easy. One batch of fudge will make 16 bears. 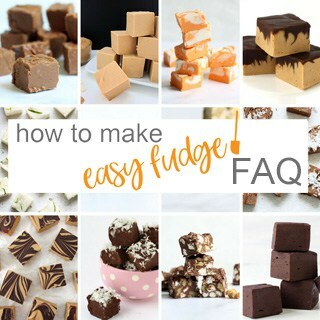 RELATED: Be sure to check out our Easy Fudge FAQ page for more tips and tricks to making homemade fudge even easier. When I set out to create these creamy squares of white chocolate fudge I decided to start with our basic Vanilla Fudge recipe which is made using white chocolate, sweetened condensed milk, and a pinch of salt. Instead of adding pure vanilla extract I used pure almond extract to give this fudge a sugar cookie flavor. You could use peppermint extract if you enjoy the cool crisp flavor of mint or use coconut extract for a tropical flavor too. 18-21 ounces white chocolate, finely chopped or 3 cups of White Chocolate Chips or white confectionery coating (Candy Melts, Candi-Quik, Merckens, Peter’s IceCaps, or Ghirardelli White Melting Wafers. NOTE: If using white confectionery coating chips (no cocoa butter listed in the ingredients) use 18 ounces, if using pure white chocolate (with cocoa butter listed in the ingredients) then use 21 ounces. Line an 8-inch square pan with non-stick tin foil or parchment paper. Stir together the white chocolate and sweetened condensed milk in a large microwave safe bowl and heat at 70% power for 90 seconds. Let the bowl rest in the microwave for 3 minutes before stirring. This allows the heat in the bowl to help melt all the chocolate evenly. Alternatively, you can melt the white chocolate and condensed milk in a saucepan or preferably a double boiler set over low heat on the stove until 75% of the chocolate is melted then remove from the heat and let rest for 3 minutes before stirring until melted. Stir in your favorite extract and a pinch of salt. Pour the fudge into the lined pan and spread into an even layer. Tap the pan on the counter a few times to smooth out the top surface. Cover with plastic wrap or tin foil and either set aside at room temperature for at least 4 hours until firm or chill in the refrigerator for 2-3 hours until firm. Remove the fudge then cut off the curved edges, if needed, then cut into 16 squares. Cut a notch in two corners of the fudge along one edge of the fudge. 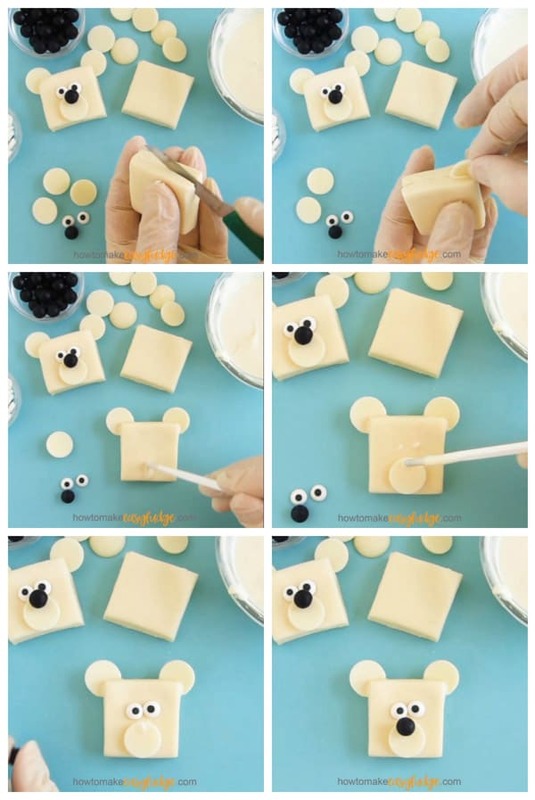 Use melted white chocolate to attach a round white confectionery coating wafer into each of the notches to create the bear’s ears. Then attach one white candy melt wafer on top of the fudge square along the opposite edge for the bear’s snout. Add a black candy nose to the snout and two candy eyes above the snout. Not to difficult either! Right? Milk Chocolate Fudge Teddy Bears and White Chocolate Fudge Polar Bears are easy to decorate and will make great gifts or treats for Valentine's Day, Christmas, a baby shower, or a birthday party. Pour the milk chocolate chips and sweetened condensed milk into a microwave safe mixing bowl. If needed heat for another 10-15 seconds at 70% power. Let rest and stir. Cover with a piece of tin foil or plastic wrap. Set aside for about 4 hours or chill in refrigerator for 2-3 hours until the fudge is firm. Remove the fudge from the pan and take off the tin foil or parchment paper. Cut off the curved edges around the fudge then cut the fudge into 16 squares. Cut the mini Reese's Cups in half creating two round pieces (one for an ear and one for a snout). Attach the larger circle in the middle along one edge of a square of fudge using melted chocolate to create the bear's snout. Then attach two candy eyes just above the snout and a pink candy to the top edge of the snout. Attach two of the smaller halves of the Reese's cups on the the opposite corners to create the ears. Line an 8 inch square pan with non-stick tin foil or parchment paper sprayed lightly with baking spray. 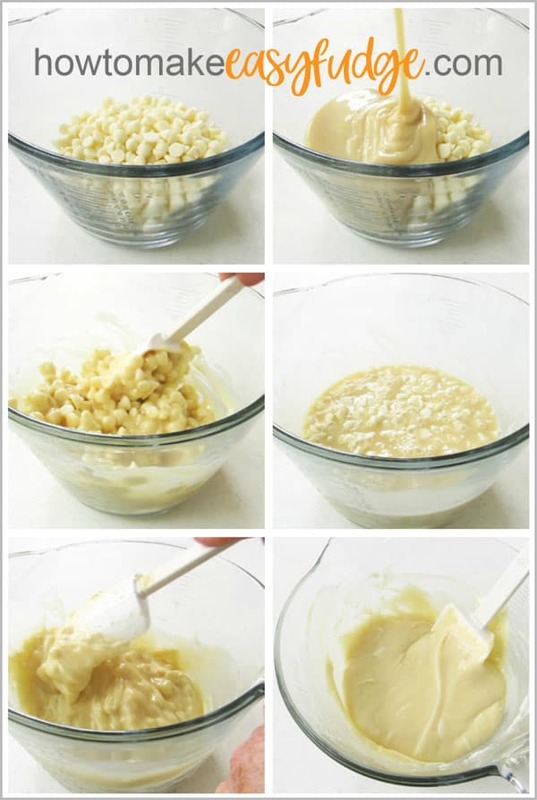 Combine the white chocolate and sweetened condensed milk in a large microwave safe bowl. Heat at 70% power for 90 seconds then let the bowl rest in the microwave for 3 minutes. If needed, heat for additional 10-15 seconds at 70% power, allowing the fudge to rest before stirring until completely melted . Stir in the almond extract and salt. Tap the pan on the counter a few times to smooth out the surface of the fudge. Remove from pan and peel off foil or parchment. Cut off 1/2 inch around the perimeter of the fudge. Cut fudge into 16 equal squares. Use the back of a knife to create notches in the sides of two corners of a square of fudge. Attach one white candy wafer into each notch using melted white chocolate. Then attach one white wafer to the top of the fudge on the opposite edge creating the bear's snout. 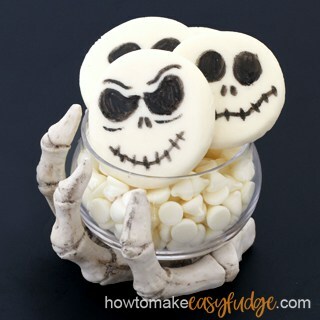 Use white chocolate to attach a black candy nose and two candy eyes to the fudge. Store this fudge at room temperature in an airtight container for up to 3 weeks. How to store these fudge bears? I DO NOT recommend refrigerating or freezing fudge once it has been decorated as the attached candies may become sticky and spotty. The Sixlets and M&M’s definitely do not do well once chilled. They will lose their color. You can see all sorts of cute bear themed desserts, here. These are SO adorable! Can’t wait to share with my daughter. These are the cutest treats! My girls love these! I’m so happy to hear your kids loved these fudge bears! How cute are these?! My kids would love them! These would be a great Valentine treat! These are so cute. My kids especially loved the polar bears. This is such a cute idea! 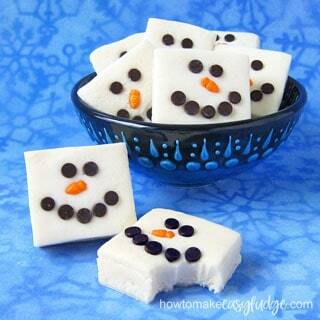 I can’t wait to make these and take it to a my nieces birthday party!